Our most recent addition to the range is now available in limited quantities, a new cheese – we’ve named it Lincolnshire Red. 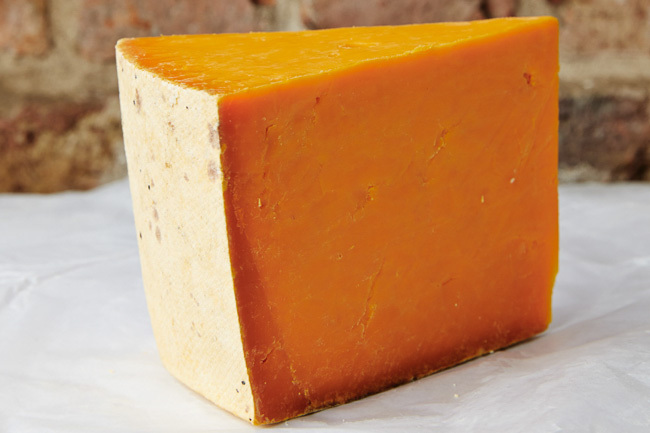 It is based on an old fashioned traditional Red Leicester recipe with a modern twist. We mature it for about 6 months (much younger than our Lincolnshire Poacher, but older than most Red Leicesters). We have added the colour to clearly differentiate it from our Lincolnshire Poacher. The colour comes from the addition of annatto to the milk in the vat at the start of cheese making. Annatto is a natural colour widely used in the cheese world and comes from the seed of the Anchiote tree in South America. Unlike Lincolnshire Poacher, it is made using vegetarian rennet. It has a moist creamy texture with a delicate buttery flavour, with a nice clean finish that lingers on your palate.